The Arby's Grand Turkey Club Is New in Town! The Arby’s Grand Turkey Club Is New in Town! There are only a handful of fast food restaurants that I enjoy eating at. Arby's is one of them. I love their lunch meat sandwiches, Beef 'n' Cheddar with Curly Fries. Best french fries in town! Do you find yourself ordering the same thing every time you go out to eat? I'm definitely a creature of habit and have never really ventured out of my comfort zone. I think the only time my fast food order has changed was when I chose a different side item and size, does that count? Though, this time I just might have to try something new. 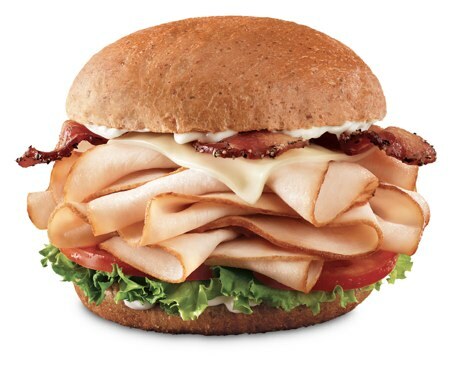 Arby's has a new sandwich in town, the Grand Turkey Club! This delicious sandwich is made with freshly sliced, hot roasted turkey, melted swiss cheese, pepper bacon, leaf lettuce, tomato and mayo. The Grand Turkey Club definitely looks better than my raggedly toddler sized lunch sandwich that I made today, and it definitely didn't contain bacon. I don't get to eat out often, we try to at home for the most part, but some days you just have to step away from the kitchen and enjoy something that wasn't made by you. This week we are melting inside of our homes with scorching heat outside, definitely not a day that I want to heat up the house with our oven. It sounds like a great time to make our way up to Arby's for a Grand Turkey Club, a side of curly fries and a shake! Thankfully, we have an Arby's just down the street, making our decision to eat out even more convenient. I'm giving you a pass on dinner tonight, Find an Arby’s near you and give it a try! Have you already tried the Arby's Grand Turkey Club? What did you think of it?